A car dehumidifier will reduce or eliminate the misting on car windows which can be a problem on cold mornings and protect the interior from moisture damage and mold. The best type for a car is one that does not need a permanent power supply is small, long lasting and safe. I will suggest several models you might consider and there are links in the text to take you to my full reviews of the units I have assessed. If you keep your car in a garage the best way to protect your car will usually be to install a garage dehumidifier although you should ensure that any model you choose is capable of effective low temperature operation if your winters are cold. Why Use a Car Dehumidifier? Inside your vehicle you sometimes get condensation on the windows which makes it difficult, or even impossible to see out. This is at best simply inconvenient, at worst dangerous. Wiping the windows with a suitable cloth can help but, unless both the window and the cloth are spotlessly clean, usually results in smearing. In cold weather, after the car has been parked for perhaps twelve hours or more, that condensation can have frozen. We can scrape it off or wait for the heater to thaw it out but can we stop it happening in the first place? Obviously we need to make sure the windows are fully closed before leaving the car. Ensure also that the heater/air conditioning vents are all closed when you leave the vehicle; it helps quite a bit in cold weather. It's also important to check your car for water leaks. Faulty sealing and blocked drainage routes can cause water to get in from above, below or any side of the vehicle. This can even happen on a new car if the problem was caused by faults during manufacturing, as I know to my cost! If your vehicle has air conditioning this will speedily clear condensation from the windows, most rapidly from the wind screen. Many drivers think air conditioning is only for use in warm weather but you can use it, with the heater on, in winter too. Screen heaters, almost always on the rear and sometimes at the front too, will help. If all else fails you may wish to use a car dehumidifier. For in-car use refrigerant models are generally unsuitable because of their size and the need for a permanently attached power cable. Water absorbing units are really the only option. A water absorbing unit can be very simple, just a tub or an air-porous bag filled with water absorbing crystals, typically silica gel, to draw moisture from the air. Over time the crystals become saturated but most types, including silica gel, can be heated to evaporate the water so the crystals can be re-used. A simple solution is to buy packs of the crystals that can be placed in the car and dried in the oven as required. The crystals should be placed in a container for use in the car. Some people use open topped tubs but this is not advisable. Liquid water can collect in the base of the tub and there is a risk of spillage in a moving vehicle. Far better is a fabric bag made of a material through which air can pass. It is essential to make sure these bags are re-sealable. The crystals must be sealed in the bag while in use, to prevent spillage, and removed from the bag for drying, as the heat of the oven may cause the bag itself to ignite. This is a relatively inexpensive "do it yourself" solution but the crystals must be regularly dried or water will leak from the bag as the crystals approach saturation. A neater, though a little more expensive, solution is to use a unit designed for use in cars, closets and similar small enclosed areas. A typical example available in the UK is the Prem-I-Air RMDH-09, seen here. Visitors from the USA will find similar models on sale of which one of the most popular is the Eva Dry range of which an example is shown below. Mini models using silica gel are ideal, being designed for confined spaces. They run without the need for continuous power, simply needing a charge every few weeks to dry out the water absorbing crystals. These need about ten to twelve hours continuous charge to regenerate so if you plug in before going to work they should be ready to put back in the car when you return home. If your car is not left in a garage when not in use a dehumidifier of this type is about as far as you can go. For information about how to protect your car from moisture while in a garage see our garage moisture control page. A number of our UK visitors have asked me to say a few words about the Eco range so here are my thoughts. 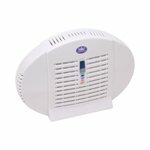 If you are looking for a car dehumidifier and you live in the UK you can hardly have missed the heavily promoted Eco and Air Dry Car Dehumidifier products. These bags of water absorbent (desiccant) material will soak up small amounts of water vapor from the inside of your vehicle and one or two will definitely make a difference to the condensation and even ice formation on the windows of your car. This type is reusable. Every few weeks it can be heated on a radiator to drive out the accumulated moisture and it is then ready to be used again. These simple units are also loudly trumpeted as "eco-friendly" which, given they use no energy and are reusable, they are. This type retails for around £13, or £20 for two. You will need at least two as once the desiccant is saturated it can take several weeks to dry out on a radiator. This does not compare particularly well with the Premiair RMDH 09 which is sold for as little as £16 (April 2011) and is widely available for under £20. This unit has an indicator to tell when it is saturated and needs only around 10 hours to recharge. This model is equally kind to the environment and has a working life of up to ten years.